So what's the (visual in 1/72) difference between a T-38 and an F-5b? IIRC the T-38 instructions give you the option of building it as an F-5 by removing bits (or maybe you remove them for the T-38?). Speed buggy is almost finished. I just need to paint pupils on the headlights and attach them along with the rear lights and number plate. Painting the Huey has begun. One of the reviews of the kit I read said it was a tail sitter (they taped a 2- coin under the roof) so I epoxied a layer of liquid gravity to the underneath of the cockpit floor and filled the centre console with the stuff before assembling it. Fuselage is all together on the Ki-46 and wings went on today. The fit really is good on these Arii kits. Won't need much filler. This is the second one i've built (first was a Ki-15 "Babs") and i've another in the stash, a G3-M3 "Nell" which i'm looking forwards to whiffing. I've also desprued a Chipmunk for the 1WGB. Looks like it should require minimal filler although location pins will have to be shaved off the nose to get decent alignment and carefull trimming of the centre section will be required for a neat fit. I found a suitable nose wheel in my parts box. Possibly, judging by the colour of the plastic, from an Academy P-39. The Hasegawa T-34 decals I was planning to use have yellowed somewhat so I have shoved them in a window to see if the meagre winter sun can whiten them. Off the top o' my head, the intakes are different. The tip tanks are more obvious as the T-38 never had any. I'm not sure what else but I've read up on people converting them and they always mention the tip tanks and air intakes. The thing is, pretty much all of 'em do it! Airfix, Hasegawa, Starfix (heheh), and a few others too that I can't recall. They just box up F-5B's , do the box artwork as if it were a Talon, and do the same for the tranfers, and that's the end of it. Don't F-5s have some small triangular strakes leading forward from the wing roots? The later F-5s have them a different shape, with a crank in the leading edge of the strake, but I don't think T-38s have them at all. Just had a romp around Google image search and it sure looks like it! Thanks for that bit... helps me out in my plane spotting and determining what kits are good and which are bunk. I also saw a bit more on what seems to be different about the intakes. The ones on the Talon are "angled" from top to bottom while the ones on the F-5 seem more straight up and down. The actual opening itself seems smaller on the T-38s as well. I do know the engines are different. On that note that's not to say the ones on the Talons are push overs! The trainer engines weren't as robust as the ones used in the fighters but in my reading I learned that they are quite powerful and back in the day those in training would do ONE (I think, or was it two,... been a while since I was reading this stuff.. ) ... mach run in the Talon as part of the curriculum. Sad thing is now, that has been reduced to zero. IIRC, isn't the centre-section under the wing less bulged as well? I'll have to pull out the Hasegawa kit and see what they tell you to do to make them different. 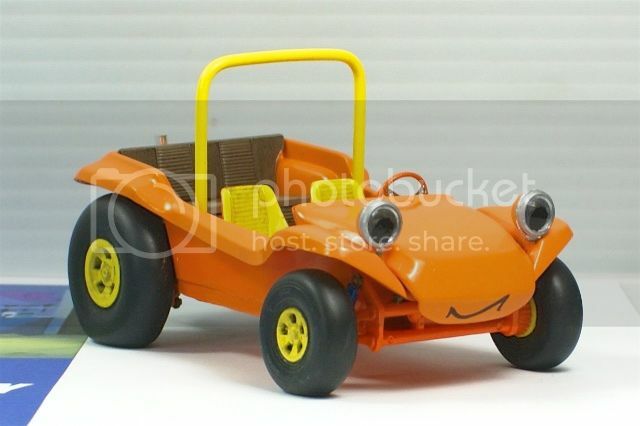 Speed Buggy is complete now apart from attaching his eyes/headlights and painting pupils on them. D'oh! Forgot to get down the Hasegawa T-38. I got distracted packing my boxes for the Ballarat NNL on Sunday (early, but Satyrday is going to be busy as were throwing a combined 13th/27th birthday party). It's a car model show but they have classes for Sci Fi, Military, Aircraft and Other so i'm taking my Hovercar, my 4 smallest aircraft and my bulldozer as well as 9 cars and the special theme truck. Thought for the day. Why is it only varn-ish? Why is it never completely varn? Pg 69 BTW. Arf arf chortle chortle fnarr fnarr snigger. Ouch. That was bad. But I can guarantee I'm going to use it as soon as the opportunity arises ! Interesting comments about the F-5 types. I had always thought it was just the leading edge. AND... a thrashing for you for forgetting glorious model kit! Is shampoo just fake poo? Use real poo! I used to watch them & also the Muppet Babies... good stuff. You know what, I forgot to look in the T-38 box again. 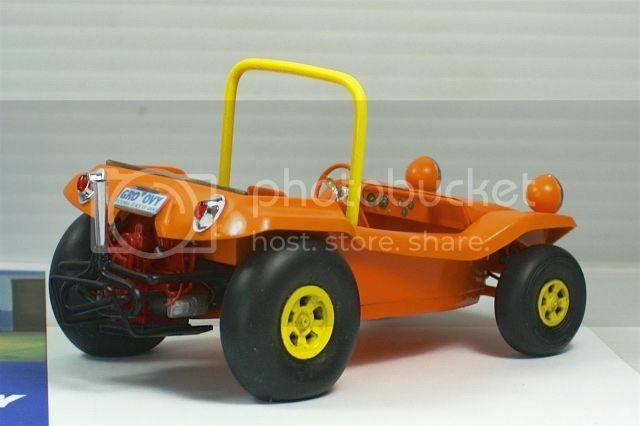 Anyway, here is Speed Buggy. He's an AMT 1/25 Meyers Manx with 1/24 Airfix Hawker Typhoon wheels on the back and 1/32 resin Hawker Typhoon wheels on the front. And here's the special theme build. The theme is "Hippy Highway". It's the truck from the Revell box scale (in this case about 1/50) Honest John set with a scratchbuilt container and homemade decals. Yes, I they inspired me to find the anime style smoking schoolgirls for the decals. Still no lookee in T-38 box.